Summer is almost over here in Australia. Last weekend was spent on the beach at Stradbroke Island soaking up a little sun. Here are some photo's of our wonderful weekend [at my friend Jody's beach house]. It was hard not to relax. REALLY BEAUTIFUL! Mind if I post one or two for my readers to remind them that summer is coming and can be so spectacular?? How lucky are you to be spending a weekend on Stradbroke!! I think there are still quite a few more weeks left to enjoy the sunshine, I hope! What beautiful photographs you have taken! I would love love love to come to Australia! Wow! 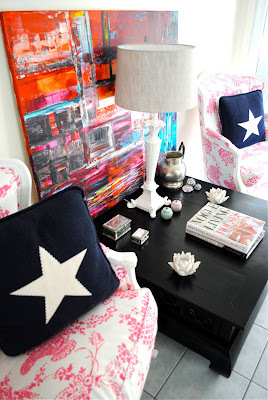 I love the happy colours in her Jody's home. I have met a distant cousin online from Australia, Robyn(near Sydny)...forget the town right now...her mum is in Perth. This looks like such a beautiful place to holiday in Simone. Lucky you! You have got to be kidding me!! This beach house (as you call it) is the most beautiful place...love the decor selections, the colors...oh my...to die for!! Looks like a perfect way to end the summer...the beach looks terrific...fun times for all!! What an honor to be able to see into your beautiful world so very far away! 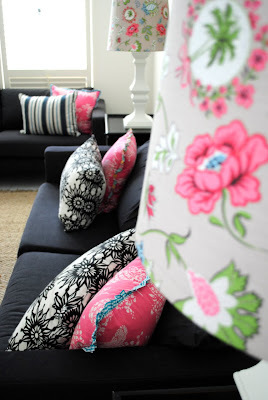 That pink and black...and the floral lamps in that first picture are just delish! We just returned from a long walk on the beach...did a bit of beach combing and drawing hearts in the sand...but our beaches don't look like that!!!! Oh...those are the kind of beaches you travel half way around the world to walk on! Thank you for sharing your lovely world. Pop over this week...I think I will post pictures of our walk and playtime on the beach on Wednesday! Enjoy the remainder of your summer!!! Your girls are just precious. Hello Sweet Friend! What beautiful photos! 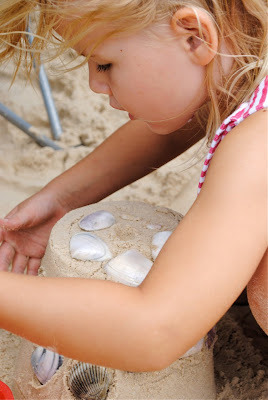 Your friends beach house is stunning and your daughter is so cute! Enjoy your last days of summer. Oh my, what a lovely time you had! We're all dreaming of Spring and Summer here!! hola simone!!!!! !qué belleza!!!! !great weekend!!!! !the house and the photos of your friend house are for a magazine! !they are beautifull!!!!! !playing and lying in that beach!!! !the paradise! !and with family and friends!!! !..double paradise! !lots of kisses!!!!! Thanks for stopping in to see our Valentine brunch! Your photos are so clear! Funny to hear your summer is almost over. We're still in winter, well as winter as we get here in Southern California! Love the all of beach house, what great taste! Just gorgeous! 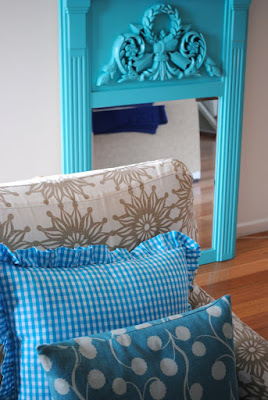 That teal mirror is WAY fab. I love those! Wow, I'm not big on a lot of colour but gee those colours in Jodie's beach house are perfect. Oh, so pretty! Love the photos so much - they're amazing. They make me long for summer up here! My it looks lovely! 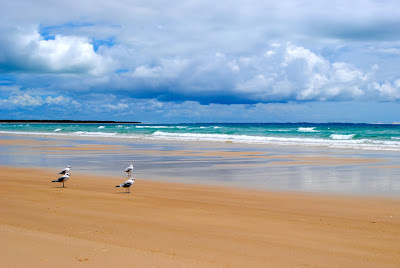 we didnt get to Straddie this visit, might try next time, it looks divine. And how is that beach house, yummo! Summer may be coming to an end for you, but it's always in your(my) mind..... Enjoy these last days. Love your photos. Hi there Simone..these pictures look lovely.I got lost in them!Its Spring here in Ireland, very very cold still.Cannot wait for Summer. 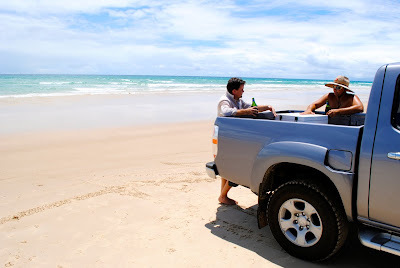 my Uncle lives in Brisbane (my aunt in Phillip Island) & he often talks about their trips down to Stradbroke Island. Definitely going to vist him oneday! What a lovely, lovely house! 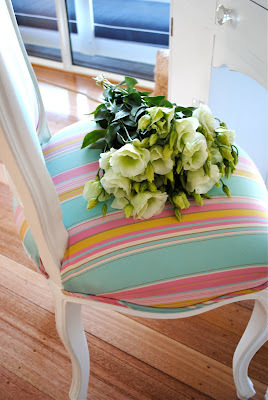 I'd build an entire decorating scheme round that striped chair. Just love Jody's house. What a wonderful life your little C has. Every little girl should have such a life. She is truly blessed. Glad you had such a wonderful weekend. Your house is EXQUISITE it is so well put together it is my dream house! Oh how much I want to go to Australia it's GORGEOUS I would have so much fun! I can't believe you took those pictures! Wow! I thought for sure they were out of some magazine!! Amazing! oh i'm jealous! looks like a wonderful relaxing time. i'm already ready for summer here! I'm hoping that spring is almost here in our neck of the woods! Grass is always greener, huh? your daughter has a wonderful, creative life! love jodis beach house! 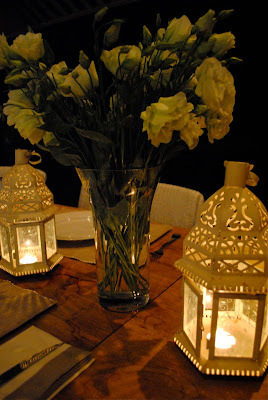 I had those same lanterns as centerpieces at my wedding so you know I love these pictures! Hopefully the photographer will finish up with the images soon so I can post them! Enjoy your last days of summer sun! 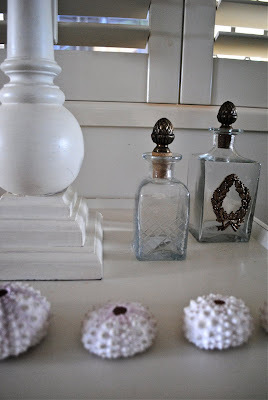 beautiful post, lifeted my spirits as I am home sick today. but also got me excited for our summer to come. looks like yours has been wonderful. Gorgeous! The home and the beach. Looks like you had a lovely time!